Good SnoWednesday, Duane & all music lovers. Hiya, Duane. Omit nothing, fill this snow day with Duane magic. Like this great thing just now. Good morning Duane and gang. Lovely sounds already. Hey Duane! Already star clicked, second song in. Off to an auspicious start! Just heard about Kraftwerk in 3D, 4/1/14 at United Palace Theater - general onsale Friday at 10:00am. Get aboard the Trans-Europe Express. cashmere cat is a great name. Hello Everybody..Hope everyone is warm wherev's you are!!! Jshatan: All over that Kraftwerk!!! I knew that was Grover even before I looked at the song info. Love it. Wow, do you remember that techno song back in the 90s by Smartees called Sesame Street? Ah memories. Whoa, Duane, be careful! Sorry we can't provide warmer weather over here. I was supposed to come to NYC three weeks ago but my plans were a casualty of cancelled flights. Hope you have better luck with yours. You're playing here? Keep me posted! Would be fun to see you. Yea, dress warm. This has been a tough winter! BLACK SHAMPOO! Heya Duane! I have this bootleg of promos. Cheri Pi: There's a bootleg? I found these in a storage space awhile ago and burned them to disc. What's the bootleg disc? @Duane - I can probably make it to the Owl. Please post details when you get them! Enjoying the music and the blaxploitation interludes today. Duane/Cheri Pi - I used to have a bootleg CD of promos too, but I don't remember the name or if I still have it. Not even sure it's the same one. Hi efd! I'm digging the Willie Hutch too. I'm drawing a blank here at work Duane, but I think it's called Soul Power and everything you've played so far is on there. There's a man and woman in profile on the cd cover with a bullet belt across her chest. OK, this wasn't on it. That bullet belt is called a "bandolier"
Revolution Rabbit isn't around to clarify that, so I'm just covering for him in the pedantry dept. Thanks @Character Limit! I expect RevRabbit to illustrate for us when he returns. Yo, Jan! I know you're thinking of the time we saw Three The Hard Way and sang along every time they played the theme song! Ah, memories. Jeremy, where you there when Cleopatra Jones pulled the gun out of her Afro? And the whole audience went f*cking nuts? Hi Duane, sweet music, love that Dwele cut. Hey Duane and everybody! How's it going? Hey Tim..What's up KRYPT? Welcome Back!!! Heyup! Good mood tunes Duane! Hey Cheri or anyone else for that matter, do you know anything about Japanese Eleki music? I picked up an Eleki record last and want to know more about the bands/record. Oh, hell yes, Jan! And Character Limit: LOL! it's gettin' hot up in this piece! What SeanG said! Those synths were outta control. awesome show today, duane. Love the promos! Note to self: Don't miss "The Swappers!" fxo: Cole's gonna be on Small Chizzy's show..
Hey there, Duane. Another sunny 70 degree day out here in Cali Forn Eye A. I could dig a blizzard or three. Heya Tim! No not really other than it so unds like it's gonna be an awesome ride! Is it all surf sounding stuff? Have to go, will catch the rest on archive. Great show! yeah, eff this snow. My boss was just talking about moving the whole company to California so we don't have to deal with this BS. Lived here my whole life and I'll never be "used to it"
Oh HEY TfC, I did get Takeshi Terauchi's Nippon Guitars: from AQ 2 years ago and it's the bomb!!! Great how the voice-over guys in that 70s genre of promo usually don't sound too raw, sultry, provocative or danger-conjuring. They sound like they're doing Plymouth car model promos to play at auto shows in the 60s. CP - Yeah, it's all really cool surfy stuff. 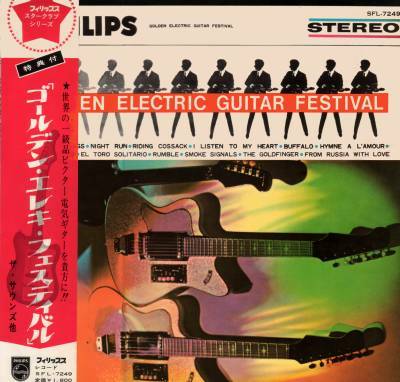 The record's called "Golden Electric Guitar Festival". The back cover is completely written in Japanese except for song titles. I haven't been able to find much about it on the web. I should get a hold of Japrock Sampler again to cross reference. CP - The bands on the comp are The Jokers, The Jumping Jewels, The Goldfingers, The Sounds, The Cliffters and Les Splectors. the triumphant return of tim fc! been waiting to see you in this forum, dude! post a link will ya TfC? is there a discogs entry? I'm curious! Hey kirk! I ain't dead yet. @Cheri: I know it well, It IS the bomb! COol lemmee check it out Time! This Cetera is the bomb. This set is ruling, Duane!